Press U and choose recomendations tab to see your current character status. 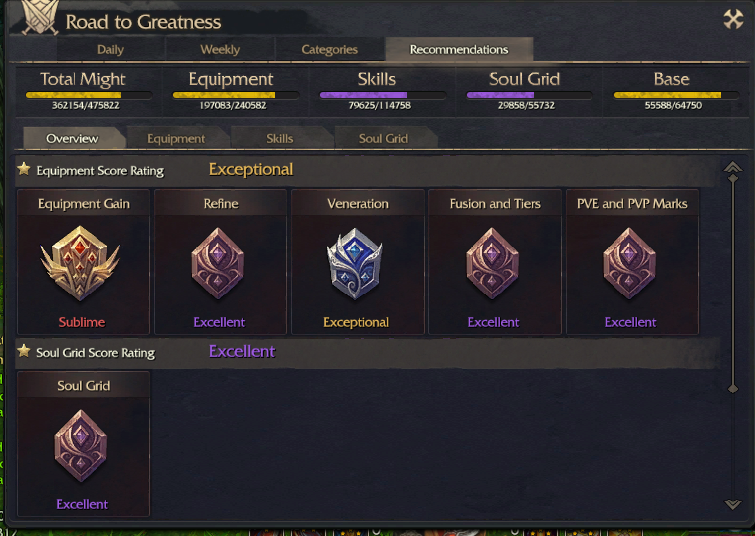 We can gain our might by refining our gears and re-roll our venerations til good (remember that golden venerations stat isn’t always good, you should choose your best status to support your build focus) don’t forget to put more marks in your gear, if you focus with PVP, then try to get more PVP marks, do it with PVE as well. You can work with Soul grids by doing faeries funland and guild events like white tiger and green dragon, guild events give us white jade and also ink jade that can be exchange to any soul crystal. Remember that soul grids give us bonuses status if we have good combos on it. ^that focus for dps that adds 200 pdb (physical defense break). here for balance status (this one is default build but need extra money to make this).